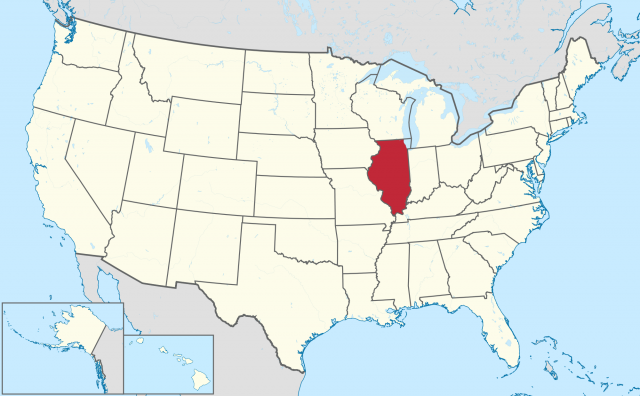 ILLINOIS IS A midwestern state located in the northcentral part of the UNITED STATES. Lake MICHIGAN and INDIANA border the state in the east, while WISCONSIN borders the state in the north. KENTUCKY lies to the southeast, across the Ohio River, while the MISSISSIPPI RIVER separates the state from MISSOURI and IOWA in the west. The state’s 57,918 square mi (150,007 square km) ranks Illinois 25th in size in the United States. However, with 12,419,293 residents, the state ranks fifth in terms of total population and 11th overall in population density. Interestingly, the top-ten largest cities in the state (led by Chicago at 2,806,016) account for about 32 percent of the total population. In terms of per capita income, Illinois ranks 10th at $32,875. The state capital is in Springfield in the westcentral part of the state. The state’s lands were fashioned by late Cenozoic glaciation when rugged hills in the north were leveled and the valleys filled in. Elevations across the state range from 279 ft (85 m) above sea level near the Mississippi River to 1,235 ft (376 m) above sea level at Charles Mound in the northwestern corner near Dubuque, Iowa. The result is a rich and interesting landscape that can be grouped into three geographic regions. The Central Plains cover most of the state running from Lake Michigan west and south. The Shawnee Hills is a narrow strip of land that rises as you move south from the Central Plains toward the Ohio River. The region is relatively small, however, ranging from 5 to 40 mi (8 to 64 km) wide and about 70 mi (112 km) long, with numerous rivers, valleys, and woodlands. The Gulf Coastal Region is another small area just to the south of the Shawnee Hills and bounded by the Mississippi River to the west and the Ohio to the east. The area is an extension of the Gulf Coastal Plain that extends up from the Gulf of Mexico. The area is generally hilly, although it flattens out somewhat toward the border with Kentucky. Enriched by numerous rivers, most of which flow to the Mississippi-Ohio system, the broad, level prairies gave rise to the nickname of Prairie State as the early settlers arrived. These rivers also provided early explorers with convenient access to the interior of the continent and played an important role in the settlement of the prairies further west. With the completion of the St. Lawrence Seaway, Illinois had access to the Atlantic seaboard via the Great Lakes for oceangoing ships. Illinois has been an important transportation hub since the early 1800s. Today, in addition to important water transportation corridors, the transportation complex also includes railroads, airlines (Chicago’s O’Hare airport is one of the busiest in the world), and an extensive highway system. The earliest Europeans to visit the area were French explorers and missionaries during the early 1600s who ventured in to lands long occupied by Sac, Fox, and other Native Americans. By 1680, Robert de La Salle had established Fort Crèvecoeur, and although occupation of the area was sparse, the region was highly valued for its fur trade. In 1787, Illinois became part of the Northwest Territories following the signing of the Treaty of Paris at the end of the American Revolution. Illinois became a separate territory in 1809 and a state in 1818. Industrial development came with the founding of an agricultural implements manufacturing company by Cyrus McCormick in Chicago in 1847 and the building of railroads during the 1850s. The 1850s also saw the rise of a young lawyer named Abraham Lincoln whose arguments against slavery brought national attention and ultimately the American Presidency in 1861. The rapid rise of industry, large inflows of immigrants from Europe, and key transportation connections provided the state with a strong economic base for success. Rich lands with adequate rainfall and a long growing season make Illinois an important agricultural state. It consistently ranks among the top states in the production of corn and soybeans. Hogs and cattle are also principal sources of farm income. Other major crops include hay, wheat, and sorghum. Beneath the fertile topsoil lies mineral wealth, including fluorspar, bituminous coal, and oil. Illinois ranks high among the states in the production of coal, and its reserves are greater than any other state east of the ROCKY MOUNTAINS. Its agricultural and mineral resources, along with its excellent lines of communication and transportation, made Illinois industrial; by 1880 income from industry was almost double that from agriculture. Leading Illinois manufactures include electrical and non-electrical machinery, food products, fabricated and primary metal products, and chemicals; printed and published materials are also important. Metropolitan Chicago, the country’s leading rail center, is also a major industrial, commercial, and financial center. The Chicago suburbs have also become important business centers. There are cities scattered across the northern half of the state with specialized industries—Elgin, Peoria, Rock Island, Moline, and Rockford, while the industrially important cities in central Illinois include Springfield and Decatur.